This morning while I waited for my coffee to be ready, I started cleaning off my refrigerator door covered with photos, school notices and postcards. 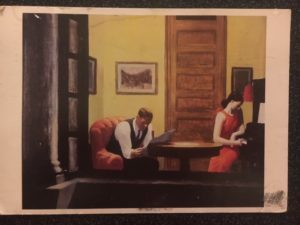 My eye went to a postcard of an Edward Hopper painting entitled “Room in New York, 1932”, that my dear, lifelong friend Susie sent to me over 20 years ago. It has lived on at least 5 refrigerators from its original home in the Queens neighborhood of Astoria to my current home in rural upstate New York. Her awareness and naming of a time in my life where I discovered my place connects me to the adventure of life and beauty of the unknown. It reminds me of what a dear, thoughtful person she is and fills me gratitude for her lifelong friendship. While I may or may not live in Paris again, to this day, her words remind me of the possibilities that life holds and that the dreams that I sometimes keep hidden, are within my reach. Friends who take some decisions or guessing away from you are god sends. So happy you have had that sort of friendship for so long. There are so many things I love about this post – the survival of a small piece of cardboard 5 fridges later, cleaning off the fridge in the morning, the words that touched you, and the memory of friendship. 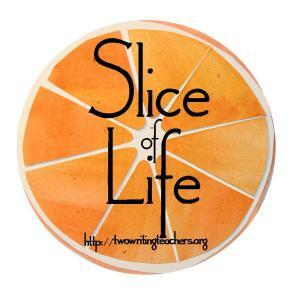 It is the perfect slice in so few words! Your post made me take a look at my “cluttered” refrigerator doors and take a walk down memory lane. Funny how precious mementos in our life end up on a major appliance for display and recognition! Glad you kept that message from your friend! I love this slice. Love the words of your friend. Love the Edward Hopper image and the meaning it has for you. Love the idea of living in Paris. I know a student attending fashion school there now. I need these thoughts as I prepare for my own future. Do live in Paris again, whatever Paris may mean in your mind now. What a great friend to be able to recognize what you needed to hear. We all need to “live in Paris” again, I think! The power of words. I don’t think your friend imagined that her words might give you strength for many years to come. Yes, dreams are essential. They may change over time, but dreams have gotten me through many difficult patches. Words of a friend are treasures kept close to my heart as well. I appreciate this reminder to keep the door of possibility open, always. I hope you get to return to Paris. Yes, a friend who helps us understand ourselves is indeed a treasure.